Analysis of the goals SCORED against Portsmouth! About time I analysed some goals that we’ve scored, eh? The Pompey game was a very odd one – we had the majority of possession without looking like we were going to score many, and also handed a couple of really presentable chances to Portsmouth. It was like we were playing in second gear, and could shift up to third whenever we fancied, but chose not to in order to conserve energy (which was probably no bad thing). 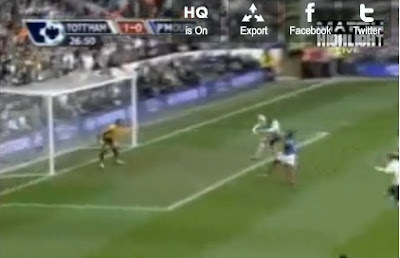 The first goal perfectly illustrated the variety that we have to our play at the moment. Gareth Bale has only started 11 Premier League games so far this year, but could feasibly win our Player of the Year award. He is recognised for his aggressive, direct running – hitting the touchline, and pulling the ball back. However, in this instance he shows that he is more than capable of mixing it up. Bale has three players around him – he probably could beat them (he’s that good at the moment), but he knows that he has an excellent target in the box. None of the Portsmouth players get close enough to influence things – they obviously aren’t aware of just how good his left foot is, and say “yeah, OK, you can cross from here”. It’s a real teaser of a cross. I would be appalled at this defending if it was Dawson and Bassong but it’s understandable, given the injury crisis Portsmouth have, that their centre backs aren’t quite singing from the same hymn sheet. Crouch meets the ball slightly awkwardly, but manages to direct the header expertly into the bottom corner, giving James no chance. The second goal is all about Kyle Walker – you will find more information on his season so far in my loanee updates. Bentley finds himself infield, but Walker was a willing runner from the first minute. 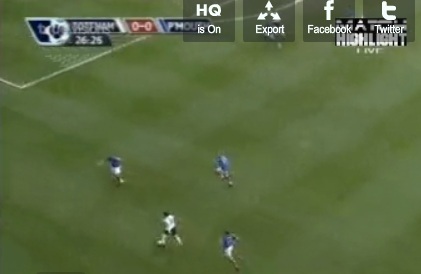 He gets high up the pitch on the overlap to receive the ball. He weighs up his options – he can either go back to Bentley, put an early ball in, or drive at Steven Finnan. Such is his confidence that he opts to get to the touchline. He doesn’t do anything fancy – just uses his close control and pace. The most impressive part of the run for me is this. He has no ball on other than the pass that he plays – but it’s not easy. He picks out a perfect cut-back to Modric, who has found himself free on the edge of the box. Luka’s shot strikes a defender, and Kranjcar shows quick feet to prod home from close range. Yet another massive game this weekend – unfortunately we’re playing Sunderland a few weeks too late. They’ve just re-found form, and are particularly good at home – they have only lost twice this season at the Stadium of Light, and are unbeaten in 2010. Having said that, we have won five from five, and welcome back Defoe. I have been saying all season that I fancy us to finish 6th or 7th, but Aston Villa’s recent slump suggests to me that we won’t finish lower than 6th. Another win this weekend would be absolutely huge for us – we’d be going into the games against Arsenal, Chelsea and Manchester United in confident mood, and with Defoe, Lennon and King returning to the fold. Great analysis,but I'm afraid you'll have to burn it now in case any opposition managers get their hands on it,lol. I don't know whether you can recall this,but Bale made a fantastic run towards the end of the game when he went through about four Pompey players before releasing a peach of a pass for Crouchy to shoot on goal,It should be on the same highlights as you have taken those stills from.Anyway if he carries on the way he's playing I can see him in centre of midfield in the future,as Harry has said he has a great engine,he can also dribble,and his defending has improved immensely.What say you? One more thing Windy,have you heard anything more about that young left back we were supposed to be close to signing?His name has escaped me for the minute. Finnan is an experienced full back but I think he was surprised by the pace of Walker, as I was. I though he had run it out of play. I think the Crouch goal was an example of the weakness of David James.The ball was in the air a long time and he could have come for it but he prefers to shot stop or make crazy runs out of his area when there is no need. This should keep the people happy who think you are anti Spurs because you analyse the goals conceded. Foggy - I think it's all about confidence with Bale. Since he's been on this unbelievable run of form, everything in his game looks better - his defending but also his attacking play. The only thing is that he hasn't yet scored - I'm sure once he gets one, another won't be far away. When you say young left back, do you mean the 16 year old Zambian lad? Emmanuel Mbola is his name. It truly was a perfect ball from Bale. Walker's move was also fantastic, showing confidence in taking it to the defence. I had a feeling Bentley was a bit weary of passing the ball to Kyle on the wing. Did you feel that too?